Call me a freak, but I get excited about cauliflower. It’s got great texture and, when cooked properly, can yield lots of big flavor. 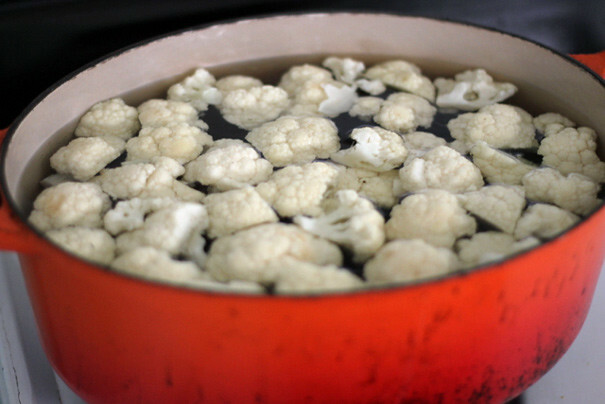 Most often I roast it in the oven or I caramelize it in a pan; not very often do I boil it, but even boiled cauliflower can hold its own. On Sunday, I was asked to bring a “vegetable side” to Craig’s aunt and uncle’s Easter brunch. I imagine most people, when presented with this request, would make a crowd-pleaser like mashed potatoes or roasted carrots or mashed potatoes with roasted carrots mashed up in there too which actually sounds kind of good but no one really makes that. Me? I went for a cauliflower gratin. The recipe comes from a book I’ve had for a long time, written by my friend Emily Farris. It’s called Casserole Crazy and, as you might expect, it’s filled with lots of casseroles. This particular one was inspired by Chef Katy Sparks and it’s pretty simple, in terms of the steps, but yields tremendous flavor. Boil them for 2 minutes in salted water. I think salting the water is an important step: when I took the cauliflower out after two minutes, it had great flavor because of the salted water. If I hadn’t done that, the cauliflower would’ve been bland. At the Easter brunch, this was a huge hit. How could it not be? All that cream, cheese, spice, and let’s not forget the cauliflower. It may not be the most beloved of vegetables, but I think it should be. There’s more to it than meets the eye. Summary: A Katy Sparks recipe from Emily Farris’s Casserole Crazy. 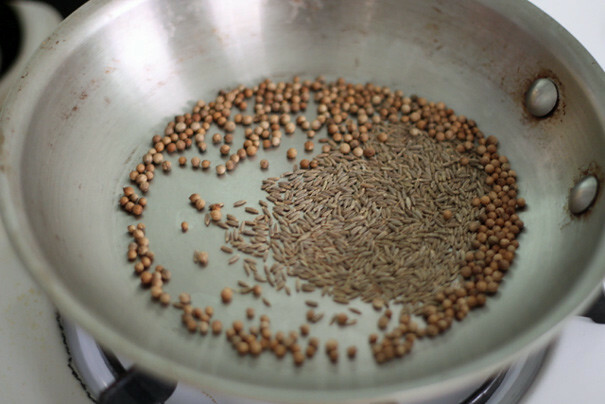 Begin by toasting your seeds in a skillet until fragrant. If you want to follow the original recipe, keep them whole. Me? I poured them into a spice grinder and zapped them a few times so they were broken up. 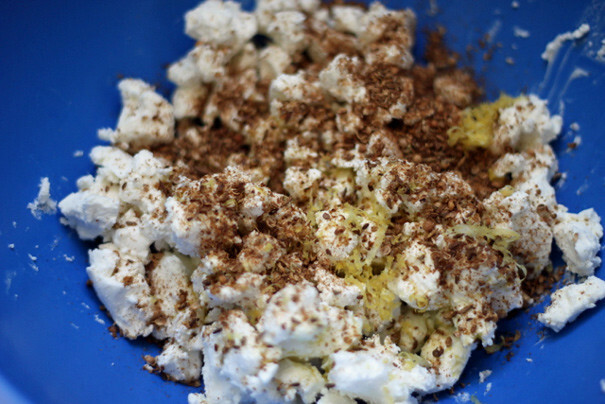 Now, in a large bowl, crumble in the goat cheese and with a rubber spatula fold in the olive oil, the spices (you may not need all of them), a pinch of red chile flakes, thyme leaves and lemon zest to taste. Adjust to your liking and let stand at room temperature for 1 hour. 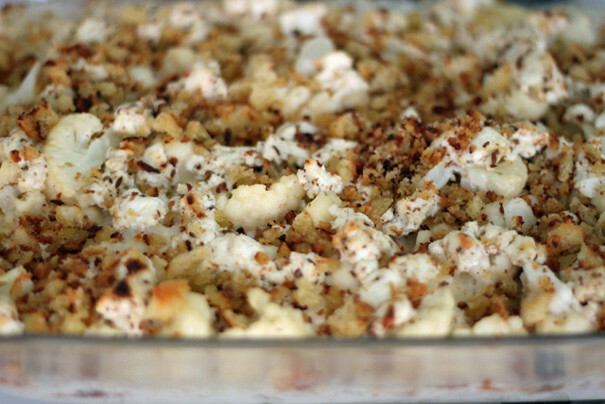 Prepare a shallow-sided gratin dish that will accommodate all of the cauliflower in a thin, even layer by rubbing the bottom and sides with the garlic clove, then the butter. 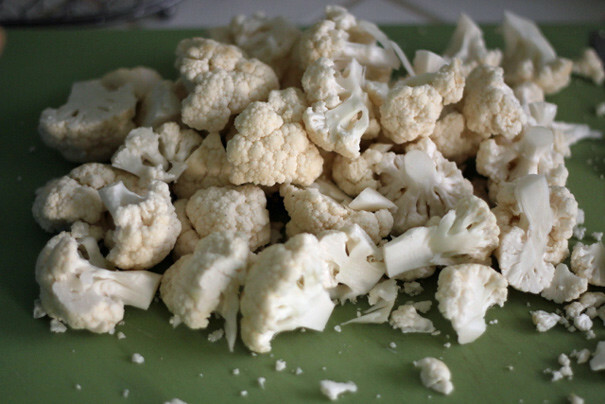 Cook the cauliflower florets in boiling salted water for 2 minutes until just tender (stab a floret with a knife to see if it goes through easily). Drain and cool. 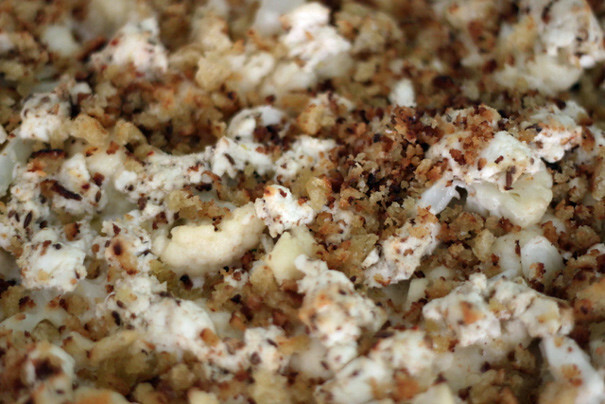 Combine the cauliflower with the heavy cream and Gruyère and season to taste with the nutmeg, salt, and pepper. 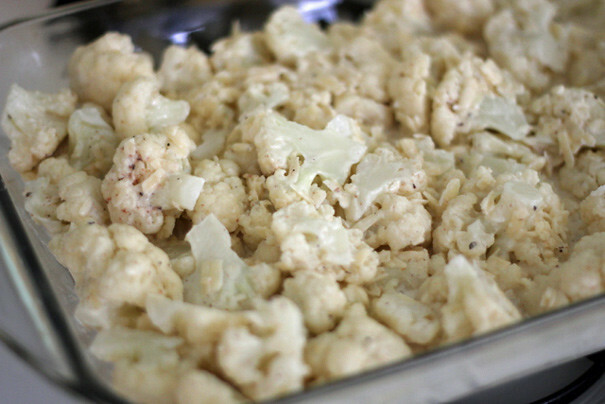 Pour the cauliflower mixture into the prepared gratin dish. 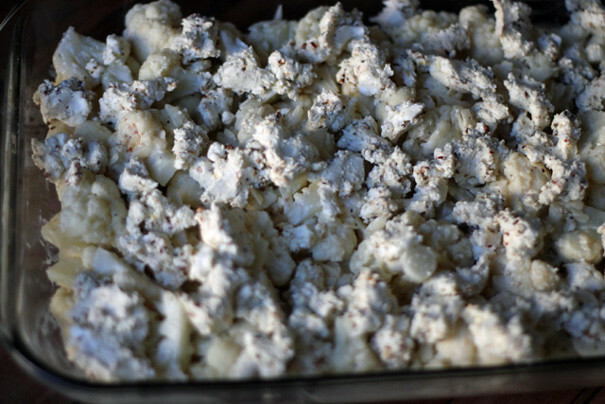 Evenly dot the surface of the cauliflower with the marinated goat cheese. 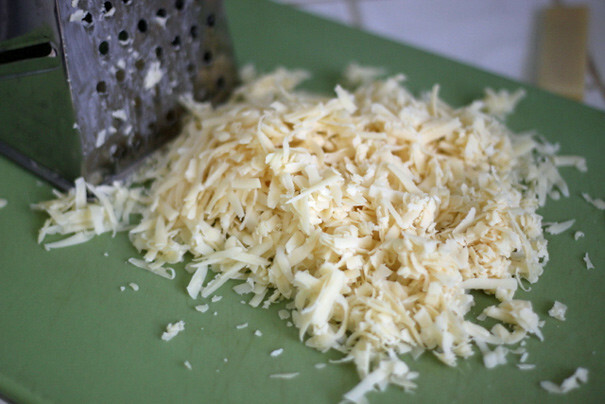 Place in the hot oven and cook until the sauce bubbles and the cheese has browned a little around the edges. Serve hot or at room temperature garnished with fresh cilantro, if desired. As I mentioned in the post, I had some toasted bread crumbs lying around from a different recipe which I patted on top after the casserole had cooked for a bit, finishing it for a few more minutes in the oven so the crumbs could adhere. To do this yourself, cut the crusts off a wedge of good bread (sourdough is best), cut the insides into large cubes and toss those cubes into a food processor. Process until you have nice crumbs and pour them into a non-stick skillet along with a glug of olive oil and a sprinkling of salt. 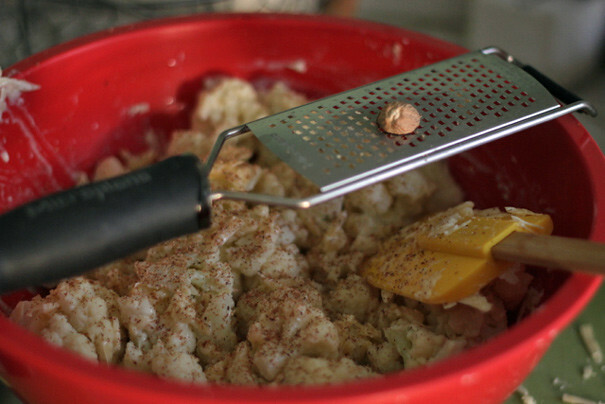 Turn up the heat and cook, stirring and tossing often, until the bread crumbs are golden brown. Whatever you don’t use here go great sprinkled over salad, pasta, anything you like.